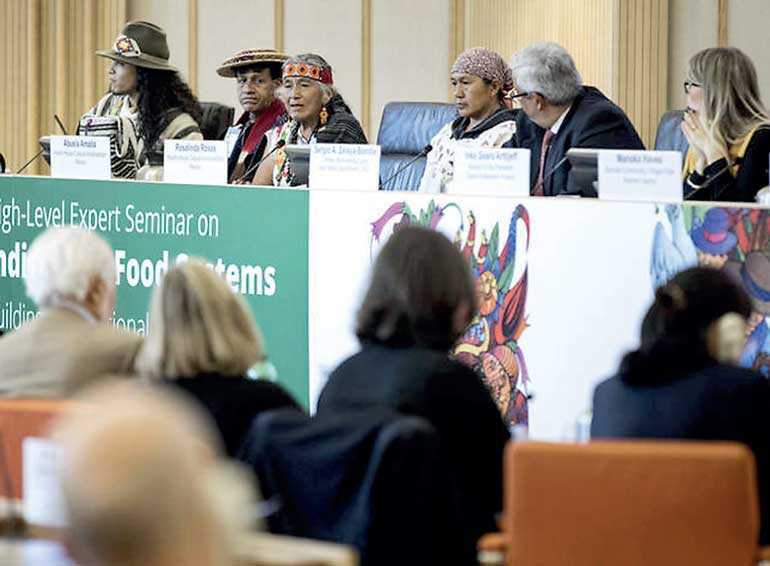 Indigenous food systems and indigenous traditional knowledge have survived hundreds and sometimes thousands of years; therefore they may have some of the answers we are looking for, FAO Director-General José Graziano da Silva said last week. FAO considers indigenous and tribal peoples as fundamental actors in the fight against poverty, hunger and all other forms of malnutrition, as well as in the promotion of sustainable agriculture practices,” Graziano da Silva said in a keynote speech wrapping up High-Level Expert Seminar on Indigenous Food Systems held to explore how to build on traditional knowledge to achieve Zero Hunger. Failing to grasp and support indigenous food systems risks losing ancestral knowledge and centuries of know-how. “The loss of biodiversity, is also the loss of our identity of our foods and medicines, said Taita Ignacio Morales, a traditional healer from the Muiska-Piuret people of Colombia. Seventy panellists coming from indigenous communities and organisations; universities; research centres and more than 180 attendees and 49 countries, exchanged their expertise and knowledge on indigenous food systems. By combining presentations on traditional knowledge and expertise from scientific knowledge, the seminar allowed to increase the understanding and contributions that indigenous food systems have been making to the world. Participants reviewed some of the analytical and field studies done over the past year by a task force set up by FAO and Bioversity International, the Center for International Forestry Research, France’s Institut de recherche pour le développement (IRD) and the Indigenous Partnership for Food Security and Sovereignty, as well as several local indigenous organisations, on how indigenous communities around the world generate food while managing the territory and the environment in a sustainable way. “In the path to achieve the Zero Hunger Goal we need more efficient food production methods. We need to cease environmentally unsound practices. We need to innovate on and open to all manner of food systems,” highlighted Patrick Rata, New Zealand Ambassador. Co-organised by FAO, UNESCO, UNPFII, FILAC and DOCIP, the expert seminar was an opportunity to exchange knowledge, understandings and concepts, which will be articulated in a future publication. The expert seminar and the publication are key contributions to the global debate on sustainability and climate resilience in the context of the 2030 Agenda and the United Nations Decade of Action on Nutrition. Indigenous peoples number more than 370 million people speaking more than 4,000 languages in 90 countries and occupying around 22% of the earth’s surface while acting as custodians of 80% of the planet’s biodiversity. Yet while representing around 5% of the world’s population, they make up 15% of the world’s poor. FAO recognises indigenous peoples as allies in the fight against hunger and malnutrition, and highlights their role in advancing the implementation of the Sustainable Development Agenda. The lack of respect of the ancestral and collective rights of indigenous peoples to their communal land, natural resources and territories combined with the lack of respect to the principle of Free, Prior and Informed Consent and reduced opportunities for political representation place indigenous peoples in situation of vulnerability. “We need to address this situation, and to give special attention to indigenous youth and women,” Graziano da Silva said. “What it is important about this seminar is not only indigenous peoples themselves coming together, but that we are forging ahead strategies and partnerships with different organizations to ensure that our food systems are visible, recognised and respected,” said Christiana Louwa Saiti from El Molo People in Kenya. Indigenous food systems are dynamic and their very persistence highlights their value as a source of insights for broader global challenges, said Helena Semedo, FAO’s Deputy Director General. Along with opening and closing ceremonies led by Abuela Amalia, a traditional healer of the Nahuatl People in Mexico, and Taita Morales, the seminar addressed topics ranging from how indigenous food systems can contribute to the Sustainable Development Goals and the Zero Hunger Challenge. Sessions were also dedicated to case studies related to communities in upland Vietnam, northern Finland, the Solomon Islands and Cameroon’s forests. Diversified practices linking pastoralism, nomadic gathering and agroforestry from Guatemala, India, Kyrgyzstan and Mali were also presented. “I think the biggest challenge now is to take what we have learnt and discussed here to the local levels, and be able to engage with communities in preserving and valuing our indigenous food systems,” Hayu Patria from the Dayak people in Indonesia. Along with spurring greater and broader commitment to strengthen the understanding, promotion and preservation of indigenous food systems, the goal of the seminar is to upscale the current indigenous peoples task force into a FAO Technical Network with bolstered links to research institutions, universities, indigenous organisations and other United Nations agencies so as to coordinate activities, and to foster an informal action network to serve as a platform for countries to highlight and support the role that indigenous peoples and their food systems can play in ensuring food security and nutrition.